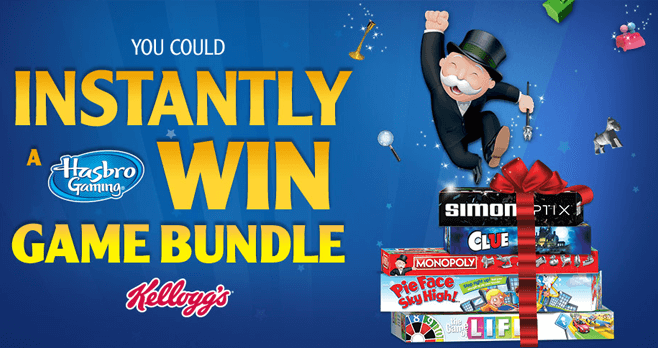 Look inside any specially-marked packages of Kellogg’s cereals for a winning sticker in the Kellogg’s Hasbro Family Game Time Instant Win Game. You could score one of 10,000 Hasbro Family Game Time Bundles featuring great games such as Monopoly, The Game Of Life, Clue, Pie Face Sky High and Simon Optix. Visit KelloggSweeps.com/Hasbro to verify your winning game piece and claim your prize. Who Can Enter? The Kellogg’s Hasbro Family Game Time Instant Win Game is open to legal residents of the 50 United States and the District of Columbia who are 13 years of age or older. When To Enter? The Sweepstakes ends on April 30, 2018. What Are The Sweepstakes Prizes? The Grand Prize consists of a Hasbro Family Game Time Bundle valued at $99.95. Who Are The Winners? For names of winners, send a stamped, self-addressed envelope by 7/31/18 to Kellogg’s – Hasbro Family Game Time Instant Win Game, Attn: Winner’s List, P.O. Box 7999, Kalamazoo, MI 49003-7999. Winner’s list to be available after 5/31/18.